It’s funny. Sophia wants a giraffe for her birthday. So, of course, the four adults in her life — Mother, Father, Uncle Conrad, and Grand-mamá — need to be convinced. A clever child, Sophia crafts four pleas, each tailored to the specific adult. To her mother, a judge, Sophia offers some legal arguments, including “In the last fifty years, no giraffes have been recalled for defective parts, and new models have a particularly strong safety record.” To her father, a businessman, she explains that giraffes “are a good source of manure, which can be sold at a profit to garden centers and activists. 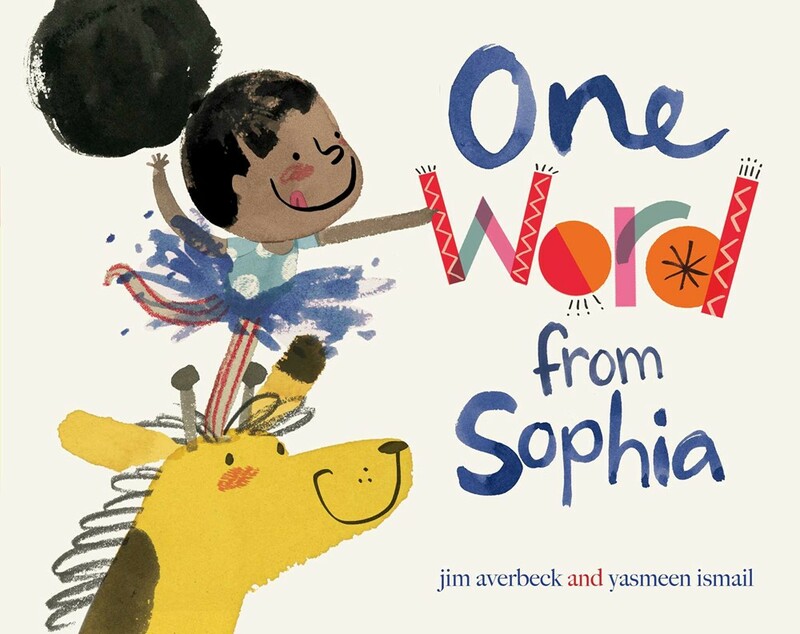 In short, people will pay me for poop.” Yasmeen Ismail’s exuberant watercolor-and-colored-pencil illustrations show both Sophia’s sincerity and the absurdity of her aspirations — but never mock her big dreams. The book loves language. A running joke — spoiler alert — is each adult’s claim that Sophia’s argument goes on too long. Averbeck has each character deliver this verdict with a different word (“verbose,” “effusive,” “loquacious”), which the book defines in the main text and in a little glossary on the inside back cover. Also, Averbeck subtly adjusts the language so that it echoes that of the formal proposal (for Sophia) and of the specific career (for the adult). For Uncle Conrad, a politician, “Sophia polled the other members of the household” — actually her stuffed animals, Mr. Bun, Tiger Eye, Pony Boy, Snakey Poo, and Ted — so that she can report that “Four out of five respondents are in favor of giraffes.” Her mother (the judge) renders “her decision” by saying “I will have to rule against a giraffe at this time.” Juxtaposed with Ismail’s expressive characters in a bright domestic setting, the workplace language is gently amusing. Sophia is smart and determined. This — in addition to the aforementioned three reasons — is why One Word from Sophia will soon be in Emily’s Library. I want my niece to have plenty of books featuring smart, ambitious, admirable female characters. The fact that the book has a sense of humor is also welcome — since Emily has a sense of humor, too. A generous tip of the hat to Michelle Martin for introducing me to this book.